Leith Court is a popular beach front apartment complex very centrally located on the main South Coast road. No. 11 is a spacious 2 bedroom, 2 bathroom apartment located on the second floor of the northern side of the complex. The open plan kitchen/living area leads on to a spacious balcony, where you dine alfresco and enjoy the spectacular ocean view. The bedrooms are air-conditioned with the master bedroom having a Queen size bed and en-suite bathroom. The second bedroom has twin beds that can be converted to a king size bed. Restaurants, banks, duty-free shopping, supermarkets, 24 hour convenience store and night spots are within walking distance. Leith Court is a beachfront apartment complex. It should be noted that beaches change their shape and size from day to day, week to week and month to month, mainly as a response to seasonal waves, currents and tides. Every effort has been made to depict the beach in front of this property, but temporary changes may occur. This beautifully restored family vacation beach house sits just off the main street directly on Worthing Beach on the South Coast, with a beach front pavilion that is the perfect spot to have an evening cocktail while watching the sunset. Supermarkets, restaurants, cafes, bars. nightlife, including the well known St Lawrence Gap are all close by. 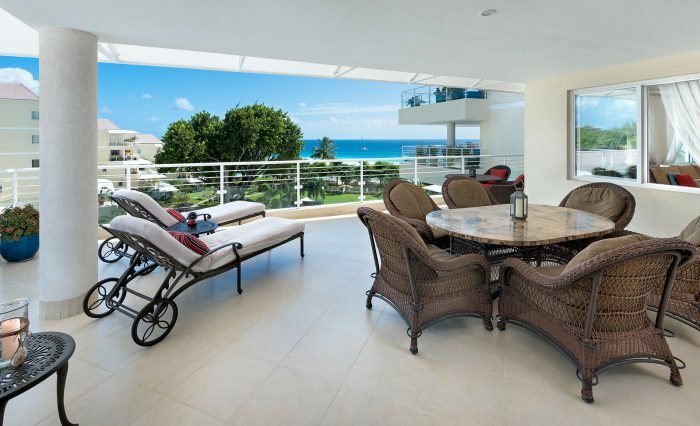 The Condominiums at Palm Beach is a luxury gated beach front residential community on the popular south coast. This top floor fully air-conditioned self catering condo offers fantastic sea views from the master bedroom, living area and balcony. The property has a gym and many excellent choices for dining and shopping are nearby.